Always fascinated with CNC's, I rationalized it was the perfect Proof-In-Concept platform for designing my Phase 2 hardware and software. Of course buying a ready made CNC kit was out of the acceptable realm of reason. I spent a couple of weeks bouncing between Inkscape & SketchUp until I had a design which fit perfectly on top of my 3'x5' steel desk in the basement workshop. 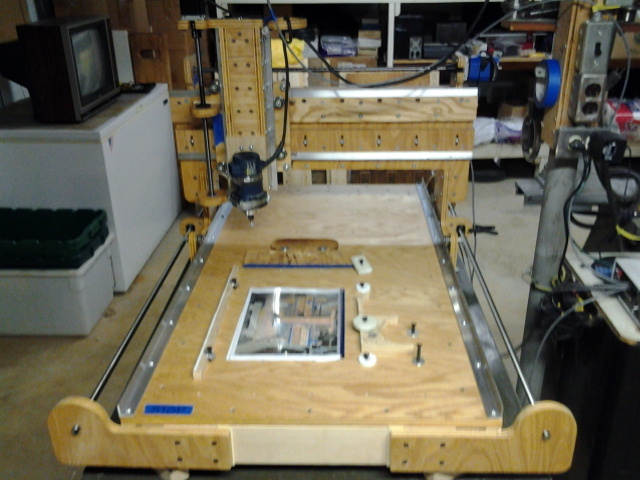 Power tools in hand, plenty of glue and plywood from Home Depot, and McMaster-Carr website, another CNC is born. The NetduinoPlus2 running my "cncBuddyCAM" is attached to a wireless router. I make extensive use of multi-threading, binary command protocol, and SDCard as a local cache to minimize network traffic while cutting. During cutting, continuous throttled location messages are sent back to the PC "cncBuddyUI" keeping the 3DViewer current. GCode cut jobs are stored and processed from the SDCard provided excellent caching performance. cncBuddyCAM is driving a 4 axis drive controller setup for 6400 steps/inch. 2 steppers are software slaved for XAxis, 1 for YAxis, and 1 for ZAxis. It's in 1/16� step/full step mode (microstepping), while the motors are 200 steps per rev. 3200 steps per rev. 2 turns per inch screws. NetduinoPlus2 drives this beast at 80-100ipm without breaking a sweat. I've even added functionality for using a Nintendo game controller for use as an analog jogging device. Have you got any information about the hardware you've used? What stepper controller have you gone for, for example? There are several hobby class CNC kits available utilizing much smaller motor loads. I required more of a medium load daily use machine shop class design. Can I assume you're not going to be making the source code available? Not at the present time. I'm heavily invested in this project as this is not a hobby for me. I will continue to provide updates/upgrades on GitHub. Hoping to create a user base, so very happy to add features and functionality to promote its use. Thank you for your interest. All suggestions are welcome! Don't get me wrong, I'm not judging you for not opening the source, I've got my own closed-source products too. It's a very impressive project, which demonstrates what can be achieved with a Netduino. I'm just not sure how you're going to build a user base though, as there isn't sufficient information for anyone to actually build one and make it work. My view on open source is that it should be done wholeheartedly or not at all. There is really no middle ground. if you publish your code then people are going to use it, and sooner or later someone will use it in a way you don't approve of. You can license all you want but this is just a fact of life, ultimately you can't control how people behave. So when I make my code open source, I do so with no strings attached. If I'm not prepared to send my code out into the world without worrying about it's destiny, then I don't open it.